Male Oak Eggar moths are commonly seen flying during the daylight in search of resting females at this time of year in many parts of the UK. Here, along the coastline of South West Cornwall, they’ve appeared in numbers in the last few days whenever the sun has broken through. 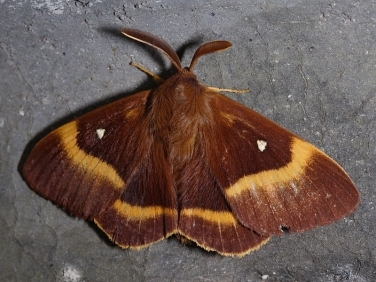 The males have comb-like antennae which are highly sensitive to the pheromones given off by the unmated females (see image of emerging male Oak Eggar moth on the left showing the antennae). They are often confused with butterflies but their flight is fast with sharp changes in direction as they sweep low, back and forth, tasting the air, over the vegetation in which females that have emerged the night before are resting. Male Oak Eggars are most often seen flying on sunny afternoons while the females fly early in the evening when they will often be attracted to light. Once a female has been found the male will mate with her and then move on to find another virgin female. A few years ago I hatched a female Oak Eggar from an over-wintered pupa and then put her in a net hung in the garden during the day. It was fascinating to see a male visit her at almost precisely three o’clock in the afternoon on three consecative days until the net was opened and he managed to mate with her. Once mated we never saw him again! No comments please ladies! Once mated the female no longer attracted any other males, presumably, because having been fertilised she no longer gave off attracting pheromones. If fortunate enough to see a static male they will be seen to be considerably smaller than the female with a wing span of about 30mm and dark rusty coloured wings. The larger female can have a wingspan of as much as 40mm and has much paler wings (see image on the right). Both male and females have an obvious single white dot near the centre of each forewing, a feature also shared by the smaller but scarcer Grass Eggar (Lasiocampa trifolii) moth. The females, as well as being attracted to light, can sometimes be found recently emerged on grass stems or low vegetation having just crawled out of their pupa. 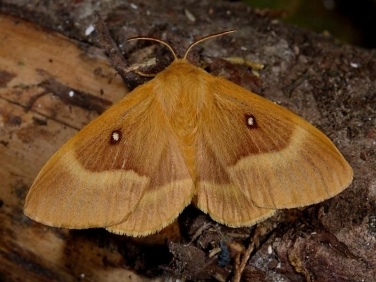 The female Oak Eggar photographed was seen on the cliff top at Lizard Point, Cornwall last weekend. The main flight time for Oak Eggars is in July and August when they may be found throughout much of the UK. In the south it has a one year life-cycle with eggs laid in late summer hatching within about twenty days and the early instar caterpillars rapidly feeding and changing appearance (see images below) with each skin change before over-wintering when half grown. 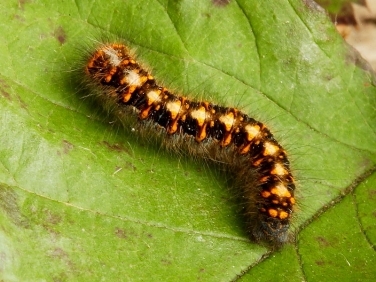 The caterpillars then complete their growing in the spring and spin a tough cocoon in leaf litter and dead vegetation. In the cooler north of the UK the Northern Eggar (f.callunae) has a two year life-cycle, over-wintering the second winter as a pupa. 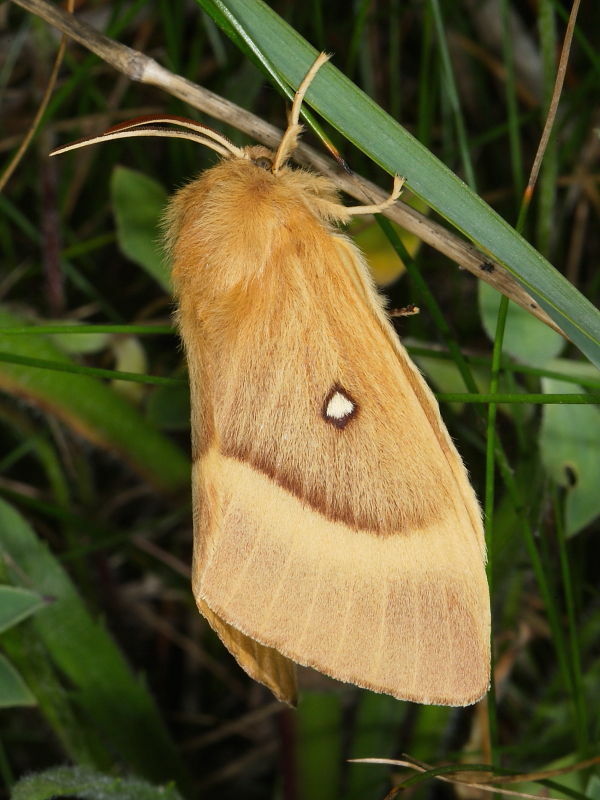 The Oak Eggar may be found in a wide range of habitats including moorland, heathland, woodland edges and sea cliffs. 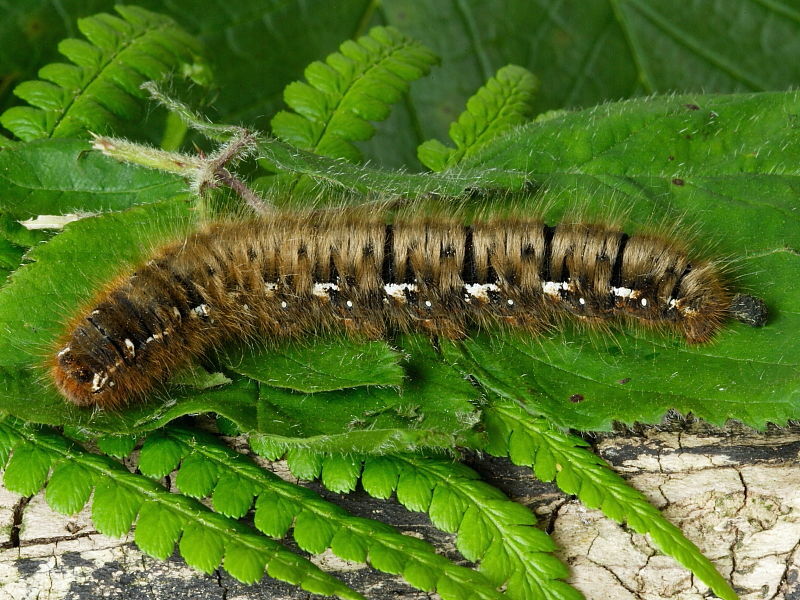 Despite its name the Oak Eggar’s food plant is not Oak but a range of low lying plants such as heather and bramble and trees including sallow and hazel. The large, hairy caterpillars, up to 80mm in length, are often seen during the day but care should be taken because their hairs can cause irritation. The females lay freely in captivity and the caterpillars readily accept bramble but, like many caterpillars that complete their growth in the following spring, over-wintering them is not always successful.